Recently a 26-year-old lady caught my attention at SHEROES Arts, Craft and Photography Community. Not because her artwork is quite attractive, but because she has recently creatively hand-painted an entire school just on the request of the Principal. That too single-handedly and without seeking any remuneration in return! Let's hear the story behind the effort from Bengaluru, Karnataka based Kavya Shree. "Mahima Ma'am...arrey, there is nothing big about it! I simply heard my inner voice. This school - Sri Manjunatha Vidyalaya - lost considerable strength after the demise of its founder, who happens to be my close friend's father. She being married off and having other responsibilities, could not take on the task of bringing back children to its fold alone. 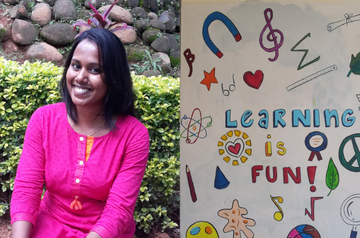 One day she called me and asked if I could use up my creativity make the school campus attractive; maybe more children would join in the new session," Kavya begins detailing the story behind these beautiful walls. She adds, "The school is for children of people belonging to a low-income group. It has a very good staff and yearly results. The school has women-only staff plus also encourages girl children towards a better future to a large extent. So I immediately gave a nod for painting the campus. And it took me five days to paint the campus. For me, it was just a matter of some strokes, but for children, the art became a very big attraction because childhood imagination and creativity has no limits," details Kavya who is otherwise a Masters in Technology!! This school is for children of people belonging to the low-income group. The only money that is charged here is for admission forms plus the cost of the books. And thus Kavya decided not to charge any remuneration in return, she informs. She believes that her work will bring out the hidden artist in every child in due course of time. And she also adds that as a result of her selfless work, Kavya has found a great friend in the school principal...and that's her reward. So what does this PG in technology doing, besides making the world around her a beautiful place? What she tells me next is pretty moving in an age where the elderly are left away alone at old age homes. "My father, is in defense services and mother is working in the medical field (senior staff at a reputed state government hospital). I am currently on a sabbatical to take care of my father. He was suffering from issues with the spinal cord and various stages of his treatment require different kinds of fixed diet. Since mom is a working woman, I chose to drop everything else for him. I am the eldest at home. I have a younger brother. And I have seen dad double up as the mom for us when she was at work. I have seen how they balanced life as a couple not caring about what society says. And it is my turn now. Thus, I took a sabbatical six months back, as my dad needs me the most at this stage; the job can be resumed later," Kavya details all this with the same ease with which she creates an artwork. Not a pause, no remorse, no afterthought, no such emotion. Just a determination to provide the best care to her father. Forcing us all to introspect. "What are you thinking, hello you there?" Kavya's voice from behind the phone brings me back to the current moment. “How do you detail all this with such ease Kavya? I know it is pretty tough to handle such a situation.”I ask her. She explains, "I don't think too much, I just manage my time well between taking care of my dad and pursuing my hobby. I do art-work, I am into photography also to some extent. Thus, I am utilizing my sabbatical well. Recently I discovered SHEROES and now I share my works, my thoughts in various communities. And this is also helping me becoming more confident." Recently a short fiction has got shortlisted to be featured in an anthology called- The Mindful Thoughts. And Kavya is on top of the Moon, about it! Kavya goes on to add, "I guess, every person on Earth has this phase in his/her life where they feel extremely lost and have no idea about what to do in life. There were days when I felt that I am a major failure. Though I was there at home for my parents, I always found my career vanishing. That’s when SHEROES happened. I re-started my journey at SHEROES, started expressing, pinning my opinions and shared my ideologies. I could feel that security, I found answers to my fears, my queries and above all I found the lost me. I discovered the SHERO in me." Kavya Shree gives a hearty laugh, "Yes, I chose SHEROES to announce that I am in love. That is because I have found an extended family here that accepted me as who I am, when I was so emotionally low. They never judged me. So SHEROES had to be the place to break the news! I met him on the 2nd of December and fell for his simplicity. While most men express dominance, he charmed me over with his smile and simplicity. After getting to know him more, I feel connected since our thought process and basic humanly values match. When I was sure, I announced it at SHEROES!" She chuckles again like a little girl. The man of her dreams she informs, is a lead graphic designer in one of the reputed MNCs; he loves art and they are getting engaged in the first week of February 2018! Voila! So what more and what next Kavya? The bubbly girl takes a serious tone, "I am still working towards grabbing a Ph.D. and move towards astronomy; the process is taking time and many other factors are to be considered. I also create other artwork like personalized candles. I love to travel and explore new architecture so I have plans of starting a travel-art/architecture blog. And now that writing is a newbie in my kitty, of course, I plan to have a few books under my name." If #HerStory of determination and care...of colours and vibrance....of sacrifice and simplicity, has touched your heart...then don't forget to share it. And remember...Kavya Shree is getting engaged in February 2019, so don't forget to leave best wishes and loads of love for her in the comments column. You can follow Kavya on SHEROES. Also Read about The Artistic Journey Of Praaggya Sharma Who Claims Art To Be Her Escape Door. Awesome Kavya Shree. You are an inspiration to all. Keep rocking dear. Stay blessed. Ohh so now I get to know the real Kavya..so many facets to her lovely write up.. Source of Inspiration Kavya! This article made my day. Such an inspiring story...hats off! Thanks for sharing Maam! Always cherubic and ready to help. That is Kavya we know. Here is wishing her all the success in every stage of her life henceforth. Proud of u..gud to know you..a big thumbs up.. keep up ur gud work and lots of love n blessings..
Lovely.. Lovely lovely dear.. 😊🙌 Today I am feeling I am seeing a different Kavya Shree 😊😇 loved it. Wow, great Kavya. Wish you the best in life. Keep rocking. Wow. Kavyashree u r a real artist who can draw smile on anyone's face. Proud of you dear.Love you. Awesome. ...kavya...u really deserve it. U r true inspiration of younger generation n.
So proud y dear Kavya....💕💕. Your truely inspiration for all ladies .. you are truely Proud of Your Parents.... For us too. Lovely dear ...💖💖. Keep the same pace and wish you all d best for your future career . I am so moved by your humane acts...to know your selfless side. This is so inspiring! Kudos to you, Kavya, and wish you fulfill all your dreams! Thanks Mahima Sharma, for the beautiful write up!